One of those crazy busy weeks with many meetings and trying to get a pile of things done before heading out of town next week. The three days of board meetings for the Rural Advancement Foundation International (RAFI) fortunately landed during the extremely wet days (another 3.2 inches of rain). Extremely inspiring and critical work being done by their staff, I would love to talk with those of you who are able, about becoming an individual donor to their work. Betsy had a Farm to Fork picnic committee meeting, yes the planning goes on year round to make it a great event. This weekend is the Carolina Farm Stewardship Association Conference in Durham so I am putting the finishing touches on my workshop presentation. The last of the pepper trellis is coming down and Betsy got the anemones planted and mulched and we pulled one of the little tunnels over them now that they have been well watered in. With all of the rain, the cover crops look awesome. The best early growth in years! 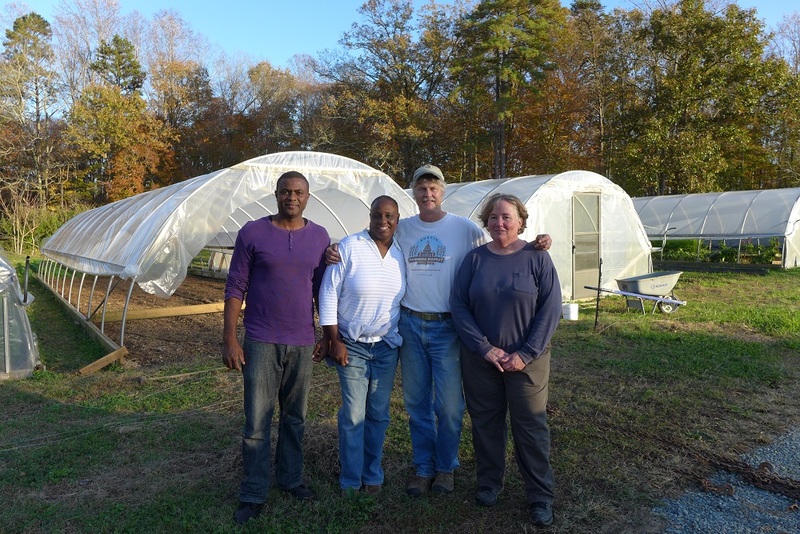 We had a great visit yesterday from the folks from Jamaica who I worked with last year on the Jamaica Farm Sustainable Enterprise Project. In country for a few weeks to both see more organic farms of all sizes and to make connections for supplies, expertise and funding. They will be talking about the project at the CFSA conference on Saturday. This is the first 9:00 market start of the season, don’t be too early! Look for Betsy and Jennie tomorrow and then Jennie will be holding down the fort by herself on the 14th. New greens this week! Beautiful Collards and Green Boston Lettuce. Mizuna to go along with the Asian Braising Mix. More Lacinato Kale, Bok Choi and Yukina Savoy. Roots, roots. Watermelon Radishes to go with plenty of Red Radishes and the spicy Shunkyo Long Chinese Radish. Japanese salad Turnips. More baby Ginger and fresh white Turmeric. Carrots and Jerusalem Artichokes as well. Celtuce is back! That nutty crisp stalk that would go great with the Braising Mix. A bit more Celery this week and a few bunches of Broccoli Raab. Dill, Cilantro and Italian Parsley. Butternut Squash and Carolina Ruby Sweet Potatoes. A few Colored Bells and a small supply of Corno di Toros. All peppers in dwindling supply- Jalapenos, Serranos, Cayennes, Picante Pimento in hots. Shishitos and the Aji Dulces, the habanero without heat. Plenty of Green Bells!